[DEC. 7, 2004] As longtime Illinois announcer Jim Shepherd introduced the beloved on Monday night in Chambana, he was able to say "the No. 1-ranked Fighting Illini." This past week both the sportswriters and the coaches agreed in their weekly polls: Illinois is the best team in the land, thanks in large part to their dismantling of previous No. 1 Wake Forest just five days earlier. 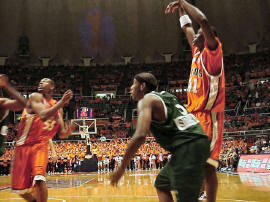 Monday's game was just the second time in school history the Illini played a game at home while owning the No. 1 poll position. The other previous home game took place during the magical 1989 season that culminated in a Final Four appearance. The opponent Monday was Chicago State, which entered the game 0-4 on the year and was blasted by Northwestern on Saturday in Evanston. While "Paint the Hall Orange" night is finished for another season, the Assembly Hall was still plenty orange and still plenty loud. Illinois didn't look particularly sharp for most of Monday night but still rolled to an easy 78-59 victory over the Cougars. The game marks the second of four games for the Illini in an eight-day stretch that head coach Bruce Weber has called "their exam week." Illinois will travel to Washington, D.C., for a road game against a young Georgetown team on Thursday before finishing the week with their annual United Center game in Chicago against Oregon, a team coached by Rockford-native Ernie Kent. The four-game stretch began Saturday with a 12-point victory against Arkansas, a game played in Little Rock. Illinois will then have eight days off to take their actual final exams before returning to action against Valparaiso on Sunday, Dec. 19. The stars of the game Monday were the usual suspects: Dee Brown again for scoring from long range and dishing out a team-high nine assists. Seniors Roger Powell and Luther Head continued to score early and often. Coach Weber and crew once again went deep into the bench, continuing to develop such role players as Rich McBride, Warren Carter, Nick Smith and Jack Ingram. And the fans -- wow -- they continue to be that much-needed "sixth man." Today, however, we want to break down what we like and what concerns us after seven games in what we hope will be another fabulous and fun season of hoops in the college basketball capital of the Midwest (yeah -- I'm calling you out, Lawrence and Lexington). The Defense. Lost in the shuffle of a great and explosive offense team is a group of players that understand basketball games are won first and foremost with great lockdown defense. The Arkansas game was a great example of this -- Illinois went ice-cold for periods of play, but it was their defense that kept a good Arkansas team from scoring a field goal for almost seven minutes late in Saturday's victory. We are especially impressed with the post defense of Roger Powell and the great improvement Luther Head has shown on the perimeter. The Team. One worry we had going into the season was in the area of egos and attitudes. Rumblings out of Champaign spoke of a rift between stars Dee Brown and Deron Williams. Insiders spoke of the selfishness of certain senior starters. Pouting and bad attitudes were known to exist in the past. So far -- so good! This team really looks like a team. Teammates seem to be more excited about an assist than a bucket. There is no "I" in team, and early on we really like the chemistry, at least on the court. The 3. The saying goes, "You live by the 3, you die by the 3." Well, after seven games, Illinois is living large by the 3, with no sign of slowing down. Mark it down -- if this Illinois team can consistently make 10-12 3-point baskets each game, we have an unbelievable chance to dance together in St. Louis the first weekend in April. -- as they have. But, we are thrilled to see Rich McBride shoot so well, all the while improving his defense. And what about Warren Carter? I almost laughed when former coach Bill Self referred to him as a "Walter McCarty clone." I'm not laughing now, but I am excited to see Carter's development and look forward to an early January return for Peoria's Brian Randle. The Coach and Coaches. We LOVE the motion offense. We LOVE the lockdown defense. We are so glad it is Bruce Weber in Champaign as we watch coaches all over America underachieve with really good talent. Even with assistant coach turnover, this group, including Wayne McClain, Jay Price, Gary Nottingham and newcomer Tracy Webster, seem to really have a handle on their team and their regular excellent preparation. Hot sophomore Warren Carter tickles the twine for two of his eight points in last night's victory for the No. 1 Illini. The Inside Game. While we love the 3 and the manner in which our guards can dominate night in and night out, we are concerned the Illini will need an inside presence to go far in the postseason. Even more concerning is the lack of scoring from James Augustine for much of the past four games. Powell is a force, but he stands only 6-foot-6, and Augustine must establish himself in the paint. While Smith and Ingram are not "back to the basket" scorers, the Illini must find someone who can score in a typical post fashion. Could freshman Shaun Pruitt seize the opportunity to join the rotation? The Superstar. We are probably worrying about nothing (we are really good at this), but it seems as if the Deron Williams of 2003-2004 is missing in action? Could the curse of the Preseason Player of the Year honor be striking Deron early this year as it did Cory Bradford in the fall of 2000, Frank Williams in the fall of 2001 and Brown last season (all preseason honorees)? We sure hope not and wonder if the junior from Texas is trying too hard to make this season in Champaign his last on the way to an early entry into the NBA. Williams will probably be fine, but we look forward to a 30-point explosion we witnessed twice last year, against Wisconsin and Cincinnati. The Lack of Focus (at times). OK, so maybe we are reaching a bit, but we needed at least four things to complain about. At times, this team almost seems uninterested if the final outcome is no longer in doubt. Maybe it is too many nightmares from our Illini past, but we hope this Illini version follows the Mayfield plan -- bury them early so the walk-ons are playing shortly after halftime. The Schedule. Maybe it seemed great in July to play this four-game stretch in eight days with games in Little Rock and D.C. and the United Center. Our hope is Illinois will make it through these games unscathed and not miss a beat as they move toward the Missouri game on the 22nd in St. Louis. Illinois plays 14 non-conference games and, if they can make it through this week, will have a great chance to play Cincinnati on New Year's Eve in Vegas with a 13-0 record. Overall, Illinois is 7-0, ranked No. 1 in the country and treating their fans to a great start to their season. The No. 1 ranking is just the third in school history, and the other two seasons where such a ranking has been achieved has ended with a trip to the Final Four (1952 and 1989). It is a great time to be an Illini fan, and we close with this invitation: Even if you have cheered in the past for Tar Heels or Blue Devils or Wildcats or Jayhawks, hear us loud and clear -- THERE IS ROOM FOR YOU ON THE ILLINI EXPRESS! Join the bandwagon today! Think Orange. Live Orange. Go, Illini!